Gerg's parents cruised in for Mother's Day weekend. Highlights included a hike around the Eloise Butler Wildflower Garden, homemade beer and wine from dad Flanagan, plated desserts with the Vonos, cocktails with the Pearsons, and baking cookies with mom Flanagan. Gerg loves him some ranger cookies, which I hadn't heard about until we hooked up. We swapped butterscotch chips for the traditional chocolate chips, and used pecans from Carrie's family ranch out in Utah. We also swapped one duck egg for one chicken egg. They're bombdiggity. Cream together the butter and both sugars. Blend in the eggs. Into a separate container, sift together the flour, baking soda and baking powder then add to the creamed mixture, blending well. 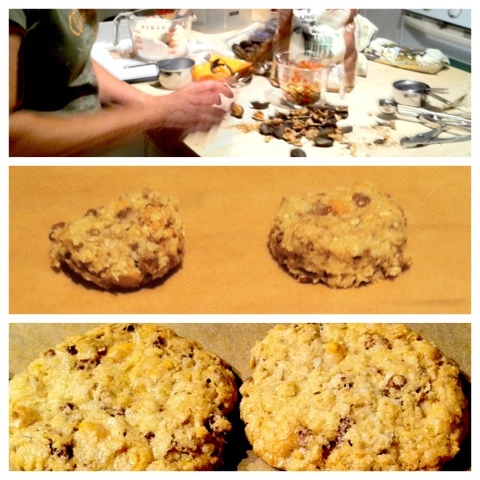 Mix in the vanilla; stir in the rolled oats, corn flakes, coconut, chocolate chips and pecans. Form mixture into balls about 1 inch in diameter. Press down with a fork on greased baking sheets. Bake in a 350° oven for 12 to 15 minutes. Makes about 5 dozen chocolate chip ranger cookies.